Jen from Mama Lion Strong kindly agreed to do a guest blog for me today! Jen is a mom to three young boys, a women’s health advocate, and the author of the blog Mama Lion Strong. 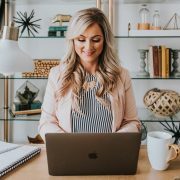 I stumbled across one of Jen’s blog posts a while back and fell in love with her writing style. We connected via social media and have been online friends for over a year. I often find myself feeling like Jen has taken the words right out of my mouth when I read her blogs, and even on areas we disagree, she always provides scientific data and a sound argument to back up her point. Jen is passionate, funny, and isn’t afraid to take a stand on something she believes in. 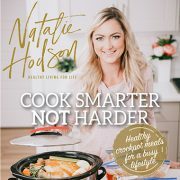 She writes about all types of motherhood topics, and is one of the bloggers in the fitness industry whom I personally follow and enjoy reading. I hope you enjoy this guest post as much as I did. If you have any questions, please leave them below and we will do our best to answer. Why Do I Have Diastasis Recti? Diastasis recti is an issue that most women learn about after having a baby. 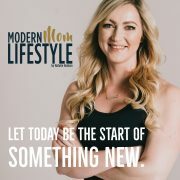 If you were anything like me, you found out you had diastasis recti after becoming frustrated with your weight loss efforts after having a baby. I was working out regularly and had lost all of my pregnancy weight but I still had a “pregnant-looking” tummy. For most women diastasis recti is commonly experienced during the third trimester of pregnancy. As a baby grows, there is constant pressure put on the back of the mother’s abdominal wall. The connective tissue joining the abdominal muscles stretches, causing the left and right sides of the abdominal muscles to separate. Many women’s abdominal muscles will come back together after childbirth but unfortunately, some women’s do not. Other signs that may indicate you have diastasis recti are a belly button that has become an “outtie,” lower back pain, pelvic floor issues (such as incontinence) and even abdominal hernias. It’s very normal to have separated abdominals right after childbirth. You should wait approximately six weeks before testing for diastasis recti. Step 2: Put one hand behind your head and place your fingertips of the other hand above your belly button. Step 3: Inhale and exhale. As you exhale lift your head. If you have diastasis recti, your fingers will sink into the separation between your abdominal muscles. Step 4: Feel above, below and behind your belly button to determine how long and wide your separation is. Here is a great video showing how to test for diastasis recti. Be sure to exhale as you lift your head off the floor. 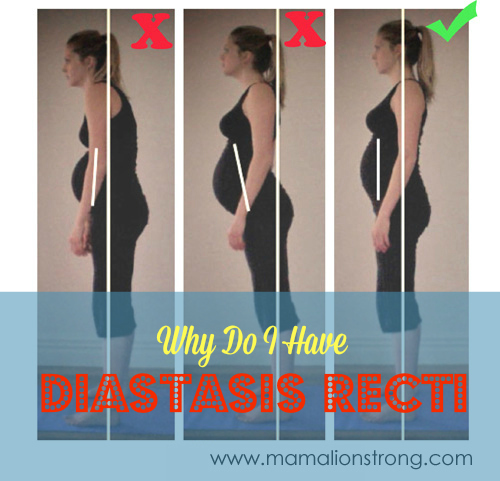 I Have Diastasis Recti… Now What? The first thing you need to do is STOP doing exercises that are making your diastasis worse. These exercises include sit-ups and crunches, planks (including traditional push-ups and burpees), any oblique twists, and leg-lowering exercises. 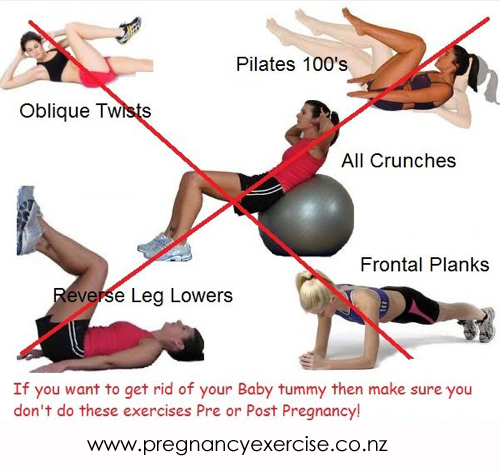 All of the above exercises make a diastasis worse. Crunching and twisting movements pull the abdominal muscles apart. Planks, or other front-loaded exercises such as traditional push-ups, will pull the muscles downwards towards the ground. 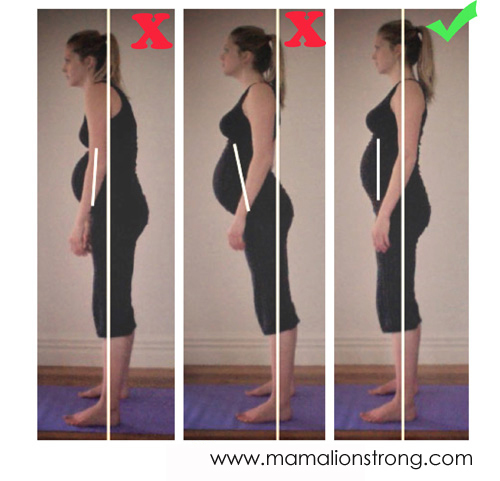 The second thing you need to do is find out if you are standing with correct posture/alignment, because this is key in healing a diastasis. Most people do not realize just how bad their posture has become, especially pregnant women. When your body is aligned you should be able to draw a line vertically from your ear to your ankle bone and the bottom of your ribs to the top of your hip bone. Your lower back should always have a slight curve. When your body is properly aligned, than your abdominal muscles are in the correct position to heal. Using bad posture/alignment means that your abdominal muscles are being pulled apart or squished together, which will stop them from healing. We should strive to have our bodies aligned at all times, especially while exercising! The third thing you need to know after you find out you have diastasis recti is the proper rehab exercises that will help heal it. Performing transverse abdominal (TVA) focused exercises will help to close or minimize your abdominal muscle separation. Performing them while pregnant may reduce your risk of diastasis recti altogether! Here is a great TVA-focused exercise, leg slides. Last but not least….. If you have diastasis recti it is best to put your body in the hands of a professional. It is not just an aesthetic issue, it is a women’s health issue. About 65% of women who have diastasis recti will develop pelvic floor muscle issues, which can lead to incontinence and pelvic organ prolapse. 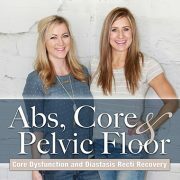 A women’s health physiotherapist or a pre and post-natal trainer will guide you to rehabilitating your abdominal muscles and your whole core, including your pelvic floor. For more information and to hear about my experience, you can visit my blog Mama Lion Strong. This blog is going to be part one in a 2-part series I am doing on Diastasis Recti. Stay tuned next week for a second Diastasis Recti guest post from Fiona at Mumafit! What would you advise to women who perhaps had there children a long time ago, say 10 or 15 years, is it ever too late to correct a diastasis recti? does it get harder the longer you leave it? Thank you Ruth! Women can heal even if they’re 20 years post! Some women (but a very small percentage) will require surgery. Rehab is always your best best bet though, even if you do need surgery you need to strengthen those core muscles so your core is functioning properly! I would start with Jen’s recommended exercises above. I will have more recommended exercises in Part 2 that will be released on Friday. I just wanted to tell you thanks so much for posting this! I have a one year old and decided to do the at home test just to see. Well, my doctor verified it today and it turns out I do have a 2 inch long gap behind my belly button! I am in the seemingly endless process of getting back in pre baby shape and my goal is to compete in a figure competition this summer! It is so critical that I now do the right exercises to fix the gap and I am so thankful to have figured it out now before I made it worse! I love reading your blog and it has now helped me more than I ever expected! Reading your comment just now made me so happy! I’m so glad Jen and I could help. Thank you so much for posting about this! I have been struggling to build core strength since my son was born. This is very helpful! Has Part 2 been posted yet? So thankful for this! I have been misinformed by my obgyn and Drs for over 8 yrs. they said crunches will help and surgery would be the only way to fix it. I’m from a rural area and women’s health is, I feel, not something near by to find. If you have more info on this and which programs would be best to follow it’d be great! I also have a herniated belly button. I want to commit to someone’s program but not sure which will benefit me most. I jokingly call it my premaprego tummy but I am self conscious about it and .secretly. Hate myself for how it looks…..anyway any help is much appreciated…and I can’t seem to locate part 2. Thank you again! What if its been 27 years my daughter’s age and I had a cesection. Is there any help? I have that lower stomach pouch and upper fat below the breast. I’m 46. What do you suggest to women who are currently pregnant? Diastasis Recti doesn’t just affect females. I am a male and I also have this condition. I need to lose weight as my tummy is larger than some of my pregnant female friends. But I have the Diastasis Recti bulge. I hope that by losing some weight and finding the right exercises, I can get rid of it, or at least minimize it. I also suffer from frequent lower back problems which I am also sure are weight related but because of the Diastasis Recti, I have to be careful about which exercises I do. How long does it take to heal and when can you resume planks, crunches, etc? You showed which exercises are good. What would you recommend replacing each of them with when following an exercise program? Could you do a video like the one above but every time you say, “Skip this exercise,” show an example of something to do instead?